If you need a reliable roof coating that is both energy efficient and affordable, acrylic is an excellent choice. Call Roofworx for acrylic roof coating installation in Fort Worth, TX and Dallas, TX today at 817-920-5974! Looking to restore your roof’s weather resistance and durability? Want to turn a dark EPDM roof into an energy efficient, cool roof? An acrylic coating will do the trick. An affordable, water-based coating, acrylic roof coatings are available in a variety of colors to match your building design. 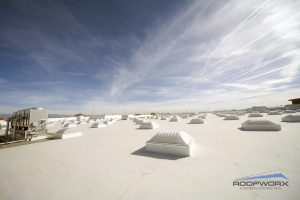 Many building owners choose a highly reflective white or light-colored acrylic roof coating to improve their building’s energy efficiency. Unlike dark asphalt roofs which absorb heat from the sun, reflective roof coatings can repel that heat. This helps keep your building temperature lower, reducing your energy bills. In the hot Texas summers, this can be a major advantage! Some facts to take into consideration when choosing an acrylic roof coating is the time of year. They cannot be installed in too cold or too hot conditions or they will not cure properly. You should also be sure to hire an experienced roofing company to install your acrylic roof coating. These systems do not stand up well to ponding water, so quality installation is essential. Over time, the elements will wear down your roof coating and re-coating may be necessary. For the price, an acrylic roof coating is an effective and efficient option. Able to withstand rain, hail, wind, and heat, these systems can add years to the life of your flat roof. To learn more about acrylic roof coatings, give us a call! To ensure that you don’t throw money away, you need a quality installer for your acrylic coating. With the right tools and experience, you can count on the team at Roofworx for all your flat roofing needs! Whether you need a new roof coating or roof re-coating, our contractors have your building covered. We work efficiently to minimize disruption to your business and property. Call us today at 817-920-5974 for acrylic roof coating installation in Fort Worth, TX and Dallas, TX.